Holy Heathcliff Batman…we’ve got a romance! Ahh British literature. It’s like an ice cold glass of lemonade on a hot day in the South: it’s utterly refreshing and makes you feel better about your day. Or at least that’s how I see it. And along with British Lit, I’m a huge sucker for star-crossed romance novels. Which is probably why my favorite book in the universe is Wuthering Heights by Emily Bronte, which is what I am recommending to you today. 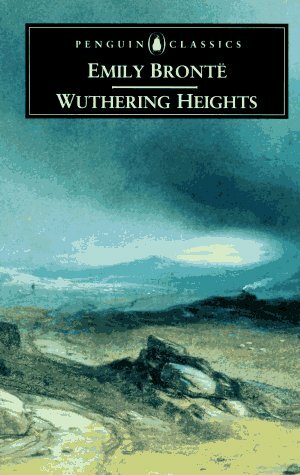 Wuthering Heights tells the story of Catherine Earnshaw and her family’s “adopted servant” Heathcliff. It’s like a reverse Cinderella story in which the female princess falls in love with the poor servant boy from the stables. However, no star crossed love story flows smoothly. They have quite a tumultuous love story and once Catherine realizes that she cannot marry Heathcliff, she berates him and leaves him out in the cold….literally. She marries Edgar Linton, a man of much higher standing but soon realizes the tragic mistake she has made. This realization leads to imminent disaster and one man’s journey for revenge against the family who made him feel less than noble. The reason why I love this book so much is simply because of the story. I know there are hundreds of similar plots out there but this one just stands out above the rest. The Bronte sisters were two of the most talented writers of their time and the characteristic I love most about them is their ability to bring passion to the page. While reading this book, you can literally feel the passion and the desire between Heathcliff and Cathy. You can feel the love they have for one another and you feel their pain during their separation. In most books of this genre, you aren’t able to truly “feel” what the characters are feeling, which I feel is quite an important factor in reading. If you aren’t able to share the characters’ emotions, then you aren’t getting the full literary experience. You also aren’t getting your money’s worth. Or you wasted a swipe of the library card. While there are about a million movie versions of this classic, my all time favorite is the 1970 adaptation starring Timothy Dalton (sigh) as Heathcliff. I believe this version captures the essence of the book better than all the rest. And Dalton embodies the character of Heathcliff and brings the right amount of vigor to the screen. My second favorite is the 1992 adaptation starring Ralph Fiennes and Juliette Binoche. These are two of my favorite actors and they have such a great chemistry which makes the relationship between Heathcliff and Cathy so much more intense and passionate, which is how it should be. My favorite quote from the book is spoken by Cathy during a secret conversation with her maid, Nelly. She speaks this when she realizes that she can’t marry Heathcliff, but the fact that she still loves him more than life itself captures her. “He’s more myself than I am. Whatever our souls are made of, his and mine are the same.” I mean does that not just make you weak in the knees? Forget Darcy and Cullen. I’m all about some Heathcliff. This week’s recommendation is another book that may have just been added to my top 10 list. 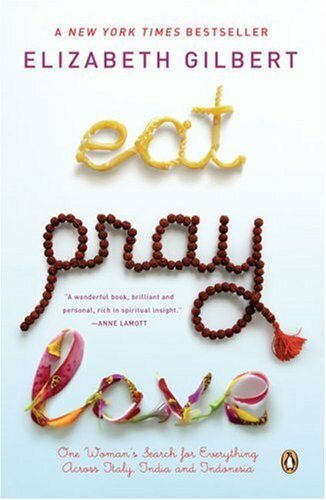 It’s Eat, Pray, Love: One Woman’s Journey for Everything Across Italy, India, and Indonesia by Elizabeth Gilbert. Some of you may have seen the trailer for the upcoming movie based on the book, which stars Julia Roberts. *insert squeal* I had heard several great things about the book before the movie even came into play but have just recently gotten the chance to read it. And I was the farthest thing from disappointed. With everything from a prophesizing guru to an old American man in India who always speaks in “bumper sticker” to a no carb left-behind mission, Gilbert has one hell of an adventure and comes up with one hell of a story to show for it. The conversational tone of the book was enough to make me love it from the start. I love reading a book that makes it seem like the author is talking directly to you and in their own style and voice. That’s why I read a lot of autobiographies and “Based on a True Story” type deals which is exactly what this book is. Eat, Pray, Love documents Gilbert’s world travels and her journey towards personal and spiritual contentment following a nasty divorce. One must understand the rule of thirds and the importance of the trinity to truly appreciate this book. In the Introduction, Gilbert makes sure to explain an Indian tradition known as the 109th bead, and the importance of the number 3. The novel is divided into three “books”, each composed of 36 stories, pertaining to her adventures in each of the three countries listed in the title. Gilbert also incorporates her brilliant use of anthropomorphism into several circumstances throughout the novel. My favorite being the “cops,” Depression and Loneliness and the conversation she has with them all leading to her being frisked and interrogated. Gilbert definitely makes me feel better about the notion of talking to myself to help when I am stressed or in panic mode. She even writes to her inner voice in a private notebook. And I thought I was the only one that did that! The whole book itself seems to be a self-dialogue to help her cope with the personal troubles. And I like that. And I hope you will too. As part of the new blogosphere, I want to instate a weekly book recommendation. I try to read a new book every week but sometimes the daily life interferes. Hopefully I will be able to give you something to look forward to. So here goes nothing. So if you don’t know this already, you will find out soon enough anyway. I love vampires and yes I am a Twi-Hard. I also love British literature. I love everything about it and will have a whole section of my bookstore dedicated to it. So this week’s book encompasses those two passions. 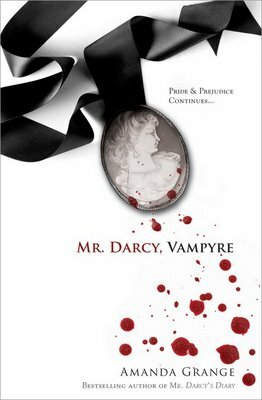 This week’s recommendation is Mr Darcy, Vampyre by Amanda Grange. As you can probably tell from the title, it has a Pride and Prejudice spin to it. The story begins on Lizzy and Darcy’s wedding day and progresses through their “wedding tour.” Lizzy begins to notice some dark things about her new husband and starts to realize that she never really knew him at all. Very strange things begin to happen to the couple on their tour and dark secrets about the Darcy family are revealed. I absolutely love this book and the way it is written. Being a huge fan of Jane Austen, Grange has been able to capture her essence and has been able to pick up where she left off in the love story of Lizzy and Darcy. The great thing about this book is that you really don’t need to have read the original beforehand to completely understand the plot. There are several character references in the first few chapters that you may not understand if you haven’t read Austen but other than that, the book flows very well and you can actually see the story taking place in your mind. My favorite books are the kind that can do that for you: paint a mental picture and take you beyond your wildest dreams. While I did not find the book terribly suspenseful, it was quite interesting to think about the Darcy family in that gothic light. This book makes you think the dashing Englishman truly harbored these secrets throughout the Austen novel. Grange’s style of writing is also a lot easier to follow, although the length of the chapters was a bit intimidating. So if you like gothic literature, vampires, romance, and Jane Austen, then this is the book for you. I highly recommend it and I promise you it will leave you with a diffrent image of Mr. Fitzwilliam Darcy in the end. The Lonely Word · Just another twentysomething with a word and a dream.